Have you ever been a fan of Alice in the Wonderland? If you have been a fan then I am sure you all must be aware of her white themed dress? 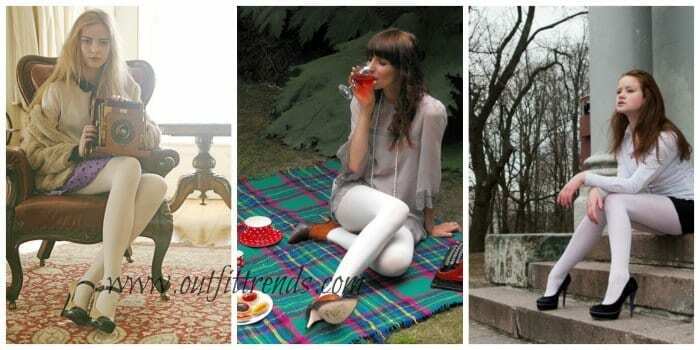 Well today we will revealing some fantastic ideas on how you can wear white tights with different outfits? There are plenty ideas and tips to wear outfits with white tights. The color white itself is a very soft color and you will have variety of options to wear with it.Since it is winters you can wear tights to keep yourself warm in the chilling weather.Also see cute winter outfits for teenage girls. you can also see some unique style tights from our previous collection.Females of all age can wear and style them according to their preference. Tights have always gained popularity among the young girls. Today, we have decided to pick up the tights which can make you look elegant and stylish.Most of us used to associate tights trend to be only for toddlers. However this trend has been famous among all of the age groups and not just toddlers. White is that one colour which can never go wrong with any combination. You can wear white tights with any colour. You need to know what kind of outfits suit you the most. Once you know it, you can start styling yourself with the choice of your outfits. You can get white tights that are available in patterns, ribbed design, colored etc. Below are several trending ways how to style white leggings with other outfits. This lady wears a white tights that has a patter design on it. She looks stylish with a gorgeous purple colour short dress with a pair of heels. Love this funky look by her. A mustard orange skirt with sea green shirt with a pair of pumps. It looks perfect with white tights. This lady wears a similar dress that Alice wore in the Alice in the Wonderland. A frock style dress with white tights is a great option for winters. Choosing the best combination for yourself is very important. It can make you look fabulous. Black is that one colour that can never lose its charm. This girl wears a fedora hat, long heels and a black dress with white stripes on it. Grey is a soft colour. Wearing it with white tights is a perfect choice. I hope these ideas have helped you to understand the kind of outfits you should wear with white tights. A little colour combination with white can add charm to the entire look. Skirts, shorts, sweaters, coats, short dress etc. all are trendy. Just try to keep your outfits simple so that you can wear them anywhere along with staying comfortable. Good luck with styling your outfit with white tights. Do not forget to carry accessories, whether it is bag or a clutch. Shoes to wear with white leggings. Long coats with white tights. College girls white leggings fashion. Teenage girls with white tights. Style it with Beanie Hats. I am a teenage girls and I have an extraordinary love to tights and thigh high socks.and mostly white.because they make me cute and beautiful.I wear white tights and over the knee socks a lot. The ladies look nice in their white stockings. Am a fan of white tights lean more towards the glossy side but do love the others. Have a few different styles from matte to the glossy Fiore brand.